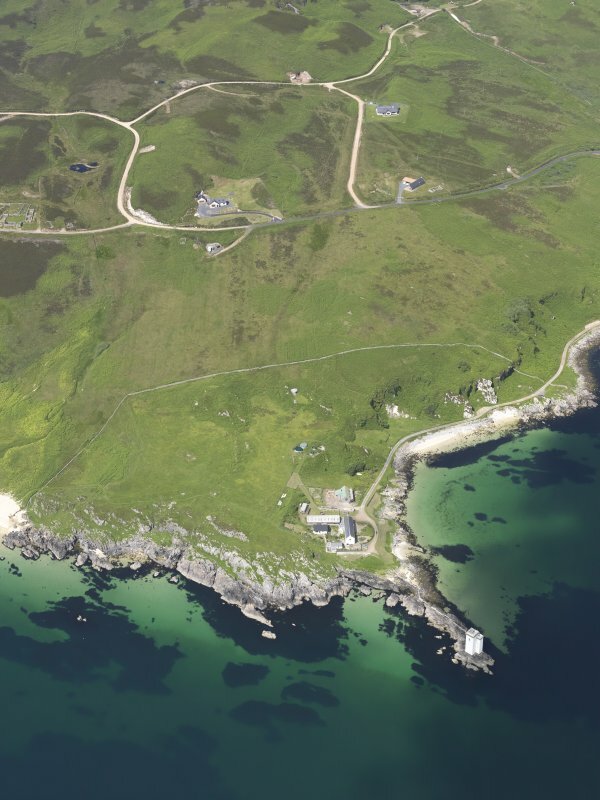 General oblique aerial view of Traigh Bhan and Carraig Fhada Lighthouse, looking NW. 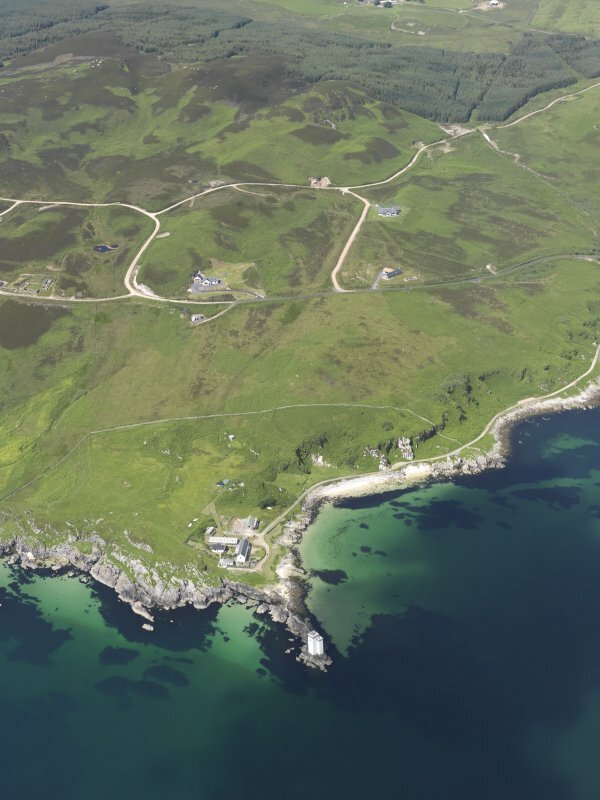 General oblique aerial view centred on Carraig Fhada lighthouse, Islay, houses and remains of the clearance cairns, taken from the SE. Port Ellen Lighthouse. Distant view from South South East. 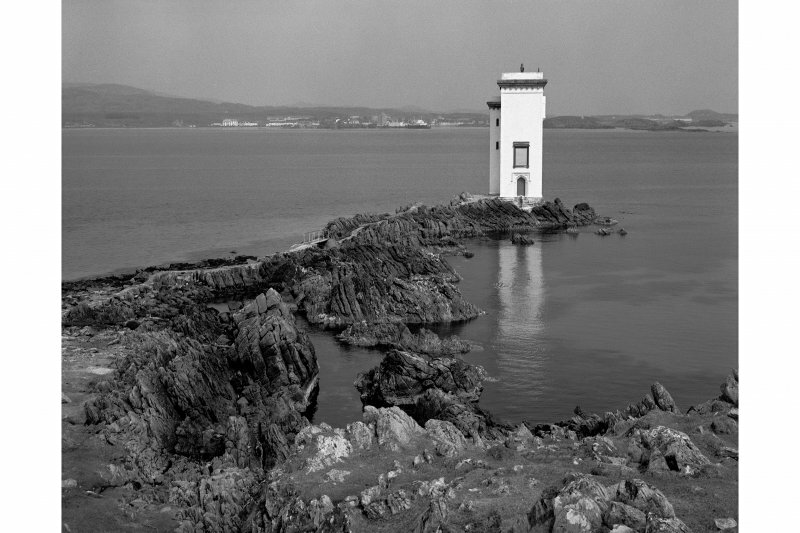 View of Port Ellen Lighthouse from West. Port Ellen Lighthouse. 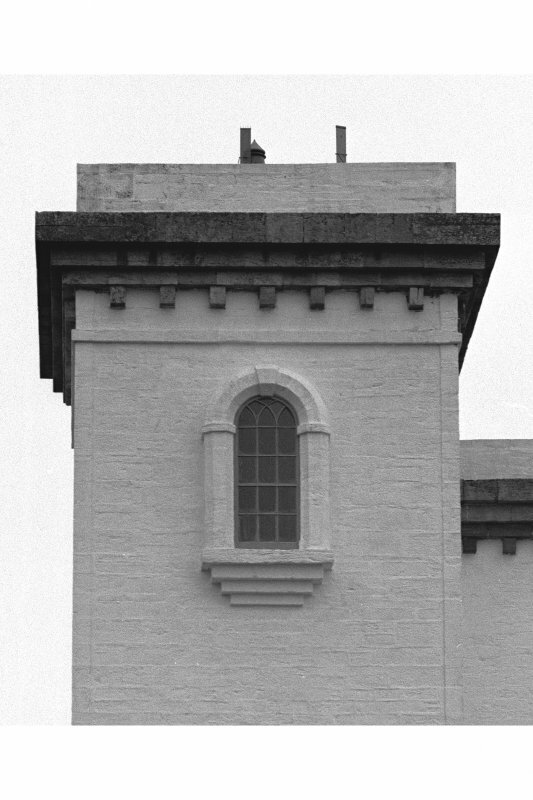 View of South wall, detail of oriel window. 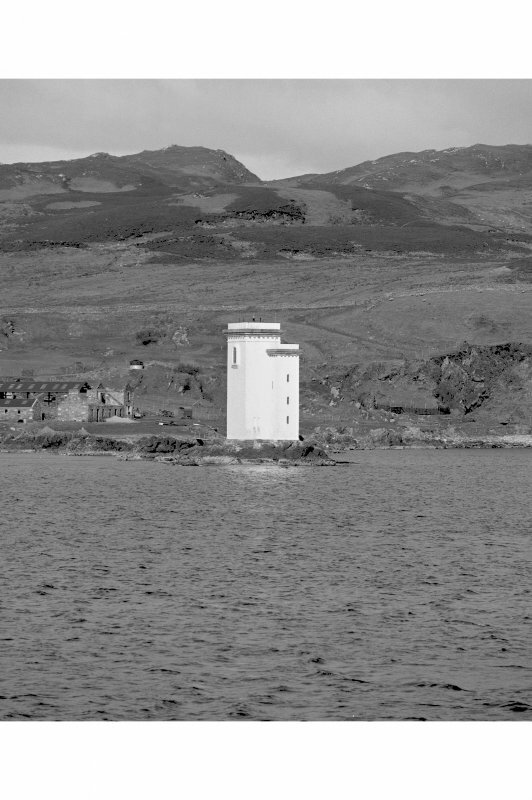 Port Ellen Lighthouse. 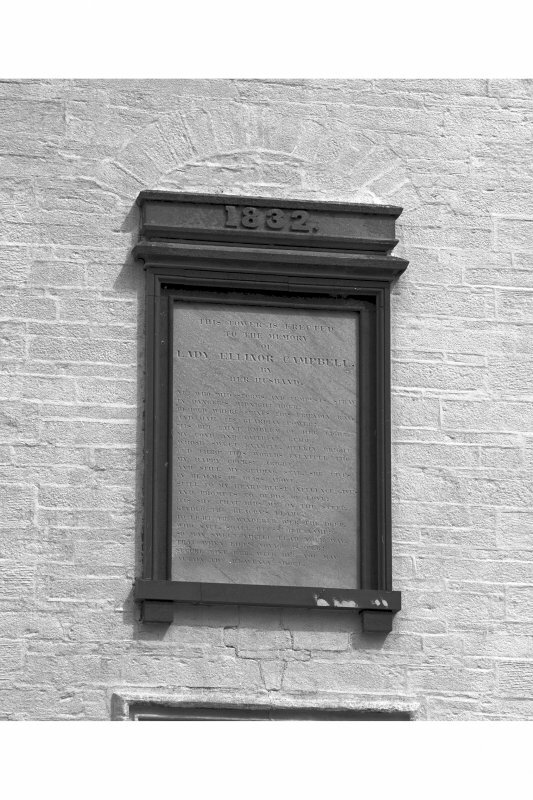 View of commerative plaque, insc:'1832' 'This tower is erected to the memory of Lady Elinor Campbell by her husband'. Port Ellen Lighthouse. View of West wall, detail of doorway and inscribed panel. 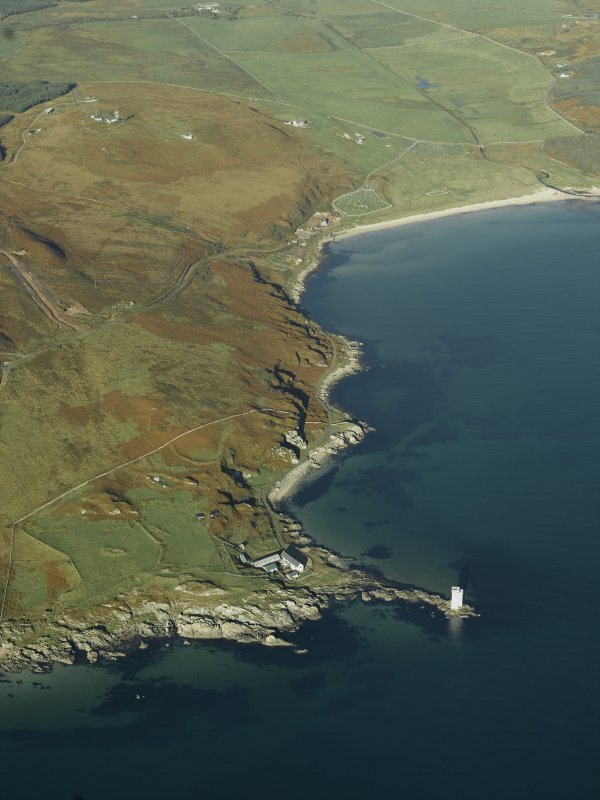 Port Ellen Lighthouse. Photographic copy of oil-painting of Port Ellen Lighthouse. For (associated) keepers' house (centred NR 34790 44330), see NR34SW 20. Campbell by her husband, Walter Frederick Campbell. plan, and at the NE angle a 3.4m square stair-tower of slightly lesser height. The walls, which measure 0.8m in thickness at base, are constructed of limewashed rubble masonry; the quoins are offset, and the other external details are designed in a variety of architectural styles. 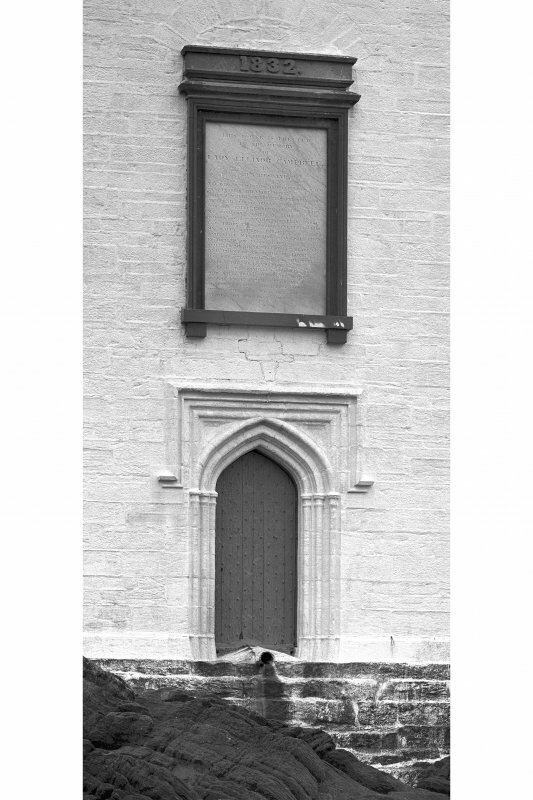 The doorway in the N re-entrant has a shoulder-headed lintel, while a formal entrance in the landward-facing W wall is set within an elaborate roll-moulded surround which has a hood-moulded four-centred arched head; above this doorway is the date and the commemorative panel (supra). The windows generally are round-headed single-light openings with chamfered external surrounds, and some retain evidence of fixed iron frames and glazing-bars. The openings are paired on the first floor while the second floor is lit by a Y-traceried oriel window in the S wall. The parapets of the main block and stair-turret are borne on triple courses of continuous corbelling above a row of dentils. The stair is of stone turnpike construction and ascends to a landing just below the second floor. Thence a ladder gives access to the flat roof where the frame of the modernised beacon and lens-mechanism is mounted. The principal internal feature of interest is a large chimney-piece in the E wall of the first-floor room whose four-centred arched opening and moulded stone surround echo the late Gothic treatment of the W doorway. RCAHMS 1984, visited August 1977. The tower was erected to the memory of Lady Ellinor Campbell by her husband, Walter Frederick Campbell.